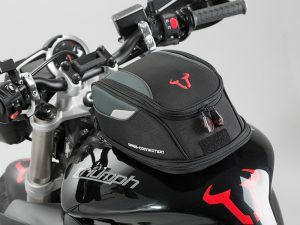 Say goodbye to straps and magnets and hello to German engineering which radically transforms the tank bag into a work of art that clips onto your fuel tank. 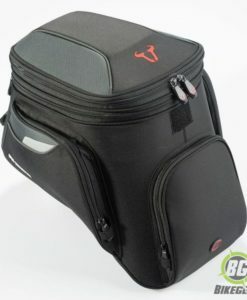 The Quick Lock Tankbag can be used with a variety of tanks regardless of material or shape. 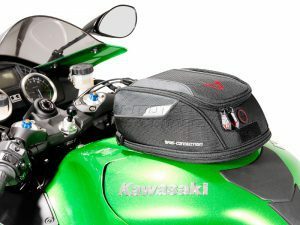 Riders now have the convenience of tank-top storage without the worry of damage to paintwork which is associated with traditional magnetic or strap tank bags. 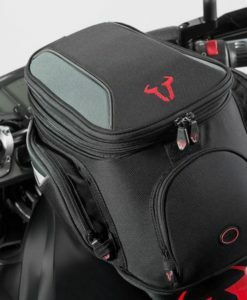 The innovative QuickLock system enables the tank bag to be easily and safely mounted onto the fuel tank via a patented QuickLock tank socket . Mounting and removal is a simple and quick operation with no worry about paintwork scratches. No Straps, magnets or hassle! All mounting hardware is constructed of glass fiber poly-amide and stainless steel, both of which are highly resistant to corrosion and degradation from UV radiation. 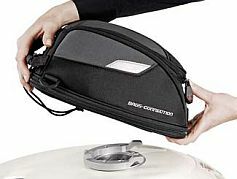 The model specific tankring is designed to allow easy access to the fuel filler cap without any hindrance. 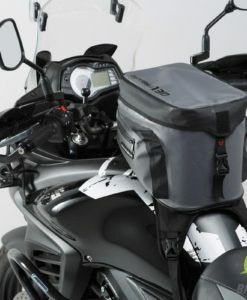 Please note that the QuickLock tank socket is specific to each model and is sold separately to the tank bag. For your specific QuickLock tank socket simply count the number of screws on your fuel cap and refer to the tank ring page here. 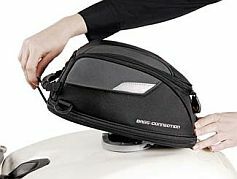 Please note that the BMW 1200GS and GS1200 Adventure from model year 2008 do not have screws in the fuel filler cap. 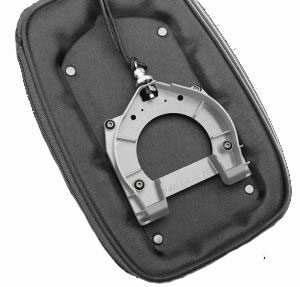 However, there is an adapter that allows for the use of the Quicklock tank ring system e.g. 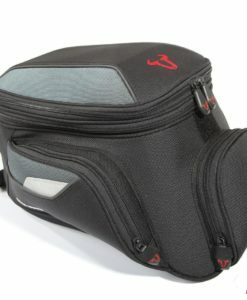 City or GS Quicklock tankbags. 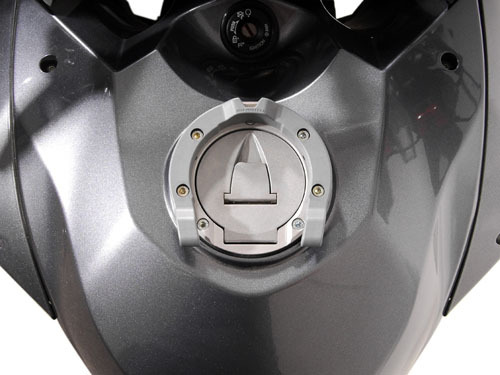 For the BMW GS 650, 700GS and 800GS twin cylinder and 2011 G 650GS there is also a quicklock solution. Click here for further details. 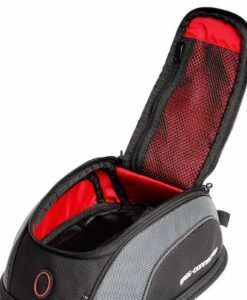 The Expandable Day-pack Tank-bag from SW-Motech carries 5-9 liters of your essential gear within reach and in style. 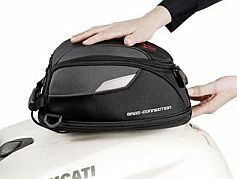 SW-MOTECH QUICK-LOCK EVO City Tank-bag was designed especially for the narrow handlebar clearances and sloping tanks of BMW GS models. 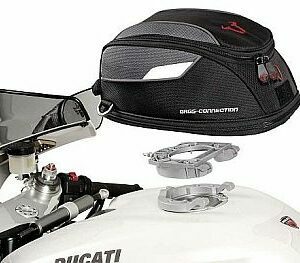 SW-MOTECH QUICK-LOCK EVO GS Tank-bag is a large 17-25 liter tankbag  designed for bikes with narrow handlebar clearance and a sloping gas tank. 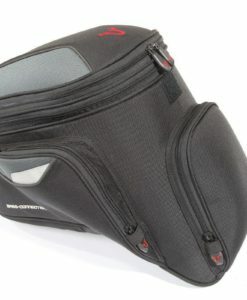 QUICK-LOCK EVO Micro Tankbag fits most bikes and is an excellent around town bag. 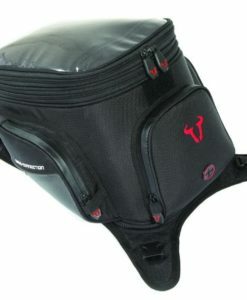 A Complete DayPack System comprising QuickLock tank socket, mounting ring and Day Pack. 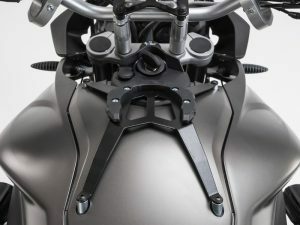 The mounting ring enables the tank bags position to be adjusted forward or backward of center by +/- 8 cm during installation, allowing for various rider styles and tank permutations. 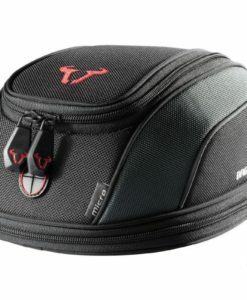 What do I need for my bike? 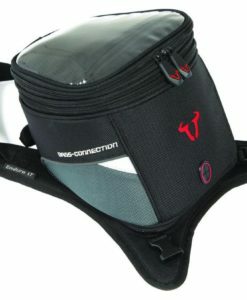 All Bags Connection tank bags are produced from high-tenacity ballistic nylon yarn (an industry leading 1680 denier) which surpasses leather, Cordura and nylon in strength. 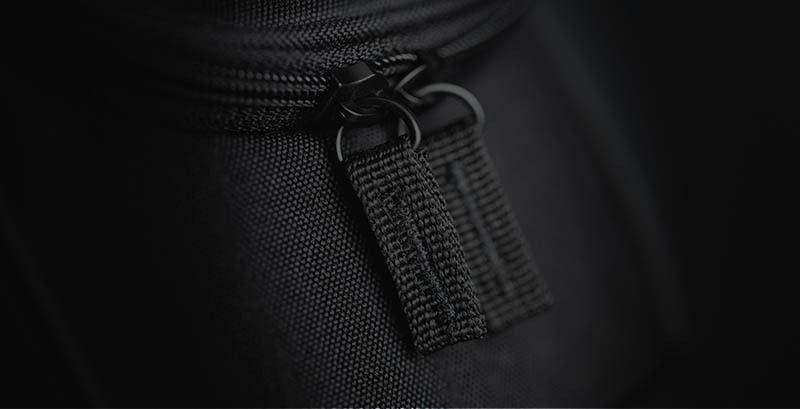 Ballistic nylon is approved by the U.S. Military for use in bullet-proof vests. 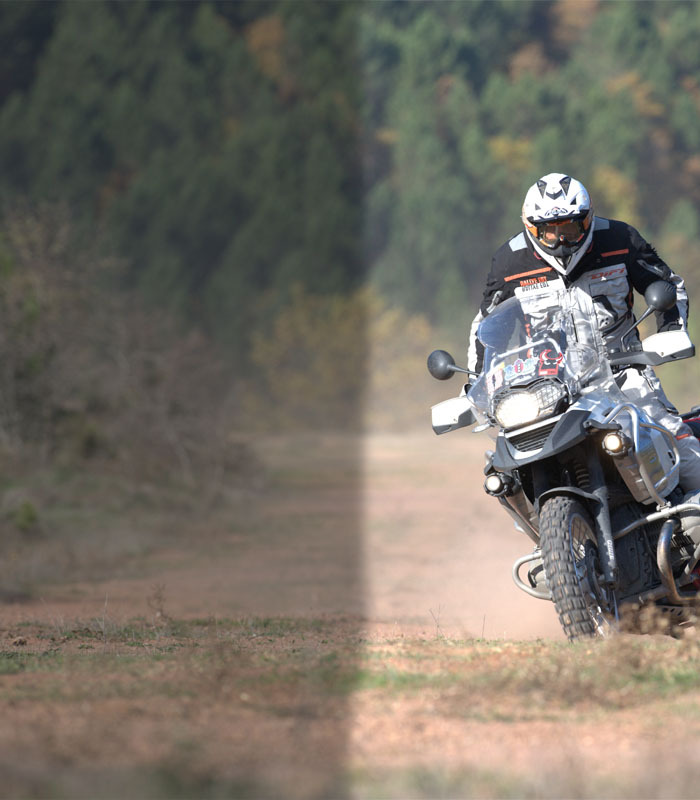 Tough enough for the military and adventure bike touring. In abrasion tests conducted vs. nylon and leather, Ballistic scored highest. Leather scuffed at 25 cycles, nylon failed at 295 cycles, while Ballistic was only affected after 3000 cycles. In tests conducted to measure tear resistance, nylon started tearing at 5 lbs ( 2.3 kg), Cordura tore at 74 lbs (33.6 kg), but ballistic held strong at 250 lbs ( 113.6 kg)! 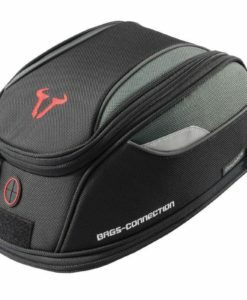 Over and above the use of ballistics nylon as the base substrate, Bags Connection only use the most durable zipper technology in the world, manufactured by the Japanese company YKK. YKK is known world wide as the pre eminent zipper producer and to this end Bags Connection use the flag ship model in the YKK range, the YKK RC-Fuse zipper. If you sand or cut the threads off the surface of a typical zipper, the zipper will fall off of the backing material, making the zipper useless. 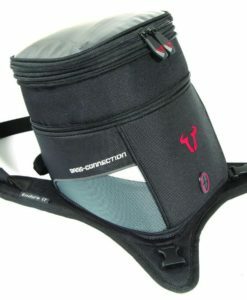 YKK RC-Fuse zipper technology is unique in this regard. Even after you sand or cut the surface of the thread off of a YKK RC-Fuse zipper, it will still stay attached to the backing material. The secret is that the sewing thread attaching an RC-Fuse Zipper to its backing material is fused together with heat, not just sewn together. This superior abrasion resistance makes YKK RC-Fuse zippers the most durable zippers in the world. 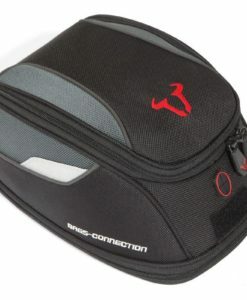 Use of RC-Fuse zippers is just one more way Bags-Connection motorcycle luggage systems deliver outstanding durability for many kilometers of motorcycle travel. 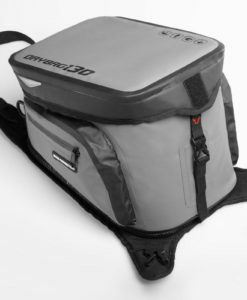 Drybag 130 Strapped Tankbag by SW-Motech is a fully waterproof, all weather strapped tank bag that expands from 13 litres to 22 litres. 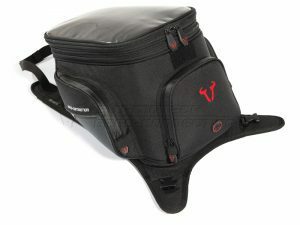 SW-MOTECH Enduro EVO Strap Style Tank-bag with a capacity of 13 Liters, expandable to 22 Liters. 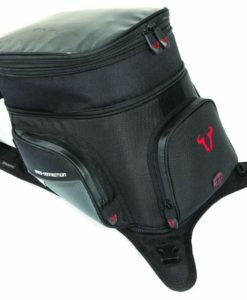 Enduro Lt Strapped Tank bag by SW-Motech offers a capacity of 5 Liters, expandable to 7.5 Liters.